Several hundred squash aficionados overflowed the movie theatre of Florence Gould Hall in mid-town Manhattan on the evening of January 22nd to participate in “An Evening With Hashim Khan And Friends” that culminated in the first full screen preview of the Hashim Khan documentary to which producers Josh Easdon and Beth Rasin have devoted the past five years. Khan himself, now 95 years old and still as awe-inspiring and dignified a figure as ever, was present, as were many of his descendants (including 12-time North American Open champion Sharif, the eldest of Hashim’s and his late wife Mehria’s 12 children, sons Charlie, Sam and Shauket, and a host of grand-children) and literally hundreds of his fans, admirers and friends, many of whom travelled great distances to be present at this occasion and all of whom were eager to see the much-anticipated documentary and to be part of what devolved into a three-hour Hashim Khan love-in. The 90-minute documentary itself benefits greatly both from the exceptional film footage that Easdon has shot of the mountainous and still-primitive Peshawar region where Khan was born (and where he is still greeted as a returning hero whenever he visits his native land) and from the compelling manner in which Khan’s improbable life-journey from impoverished roots to British Open squash champion to world ambassador is presented. Along the way, and perhaps the most praiseworthy part of the entire production, the viewer emerges at the end feeling that he or she has gotten to “know” Hashim on a personal level and has been allowed an intimate look at what Khan was experiencing inside during his squash-related travels, during his re-location from Pakistan to America (there are many quotations from members of the clubs he was based at first in Detroit for years before his permanent move to Denver) and during his metamorphosis from unknown figure into squash’s leading icon. There are also delightful nuggets of previously largely unknown information, such as the fact that Khan’s first-round match in his first British Open (which he won, eventually defeating four-time champion Mahmoud El Karim in the final, 9-5, 0 and 0, even though Khan was nearly 35 years old at the time of this 1951 event) was the first time that he (by edict of the host club) ever played squash wearing sneakers (he had previously always played barefoot) --- and that the footwear actually slowed him down initially before he adjusted to wearing them. There are just enough charts interspersed among the film footage to properly depict Khan’s remarkable career record, which includes seven British Open titles (the last of which, in 1958, occurred when he was 41 years old! ), three North American Opens, three Canadian Opens and three British Pro titles, without interfering with the commentary, and there is ample screen time as well devoted to the manner in which Khan recruited his 10-years-younger brother Azam (also a multiple British/Canadian/North American Open winner) and ultimately became the progenitor and patriarch of the remarkable Khan clan that for nearly half a century passed the mantle expertly from one member to the next while dominating the hardball and softball game. As well, there is a sufficient amount of recent-years coverage to fully convey the degree to which Khan is still beloved, indeed revered, among his Pakistani contemporaries and kin. The documentary would arguably have benefited from less air time given to a few self-styled American “experts” (one of whom showed up at the pre-film reception expecting to be lauded only to find himself instead receiving a lecture from Sharif Khan for having written a piece about the Khans which Sharif felt was not entirely faithful to the truth) and from more of an opportunity for greats far better positioned to credibly assess Khan’s legacy to voice their thoughts, like multiple-times British Open champion Jonah Barrington (whose comments were remarkably incisive and entertaining) or two-time North American Open champ (and U. S. Squash Hall Of Fame inductee) Diehl Mateer, whose vivid recollections of the numerous matches he played against Khan during the 1950’s and 1960’s were especially insightful. Similarly, there were several intriguing themes (like the rivalries BETWEEN Khan family members) that were only briefly referenced without being more fully elaborated upon, which would have made for fascinating listening. And of course it is unfortunate that Khan’s best years and hence many of his best matches, took place at a time before squash tournaments were being filmed for posterity. However, the foregoing constitute only minor hindrances to the enormously positive impact of the overall production, which received a prolonged standing ovation at the end before being followed by a question-and-answer session in which Hashim (who now walks with the aid of a cane after fracturing his hip two years ago during his weekly doubles game) and Sharif Khan responded to points raised by the audience. 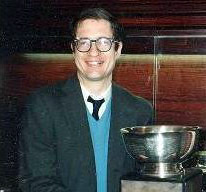 The following evening this pair were honored on the four-glass-wall PSA portable tour court in Grand Central Station about 15 blocks south-west of Florence Gould Hall, where Tournament of Champions chairman John Nimick conducted a special ceremony in tribute to their achievements prior to the start of main-draw play. Many of the spectators on hand that night, still buzzing from the excitement of the screen preview less than 24 hours earlier, were eager to congratulate Hashim for being the first squash player ever to have been the subject of a documentary of this dimension. Rasin and Easdon have applied to have the film included in the prestigious Tribeca Film Festival and will be hearing back in the next few weeks from the organizers of that event. Plans are also underway for inclusion in other film festivals, for distribution to TV networks and eventually for the production of DVDs that can be sold to the general public. Based on the reaction to what has to be termed a magical evening in New York, there is likely to be a large demand from the squash community to have access to a film that does such an exceptional job of defining and celebrating a transcendant protagonist and truly newsworthy and extended era in the history of the game.